Nothing says summertime better than tomatoes. The markets are stocked full of tomatoes of various shapes, sizes and kinds. We even have tomatoes growing in the garden and hopefully they will produce this year. We like tomatoes and cheese. Who doesn’t? The combination together is incredible. 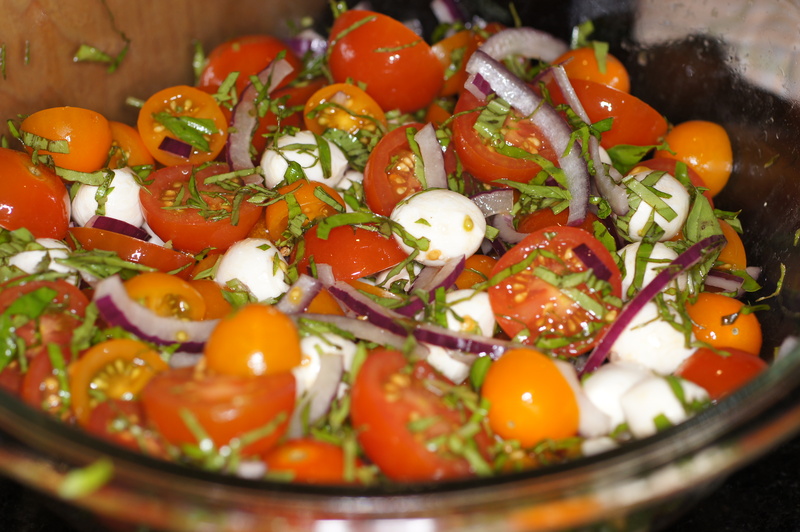 I especially like tomatoes and blue cheese but there really is nothing better than tomatoes and mozzarella cheese. Somebody in the Isle of Capri realized this and created this salad. When the King of Egypt, King Farouk, came to visit Capri in the 1950s the salad became an international sensation. It’s so easy, tasty and beautiful (It has all the colors of the Flag of Italy). 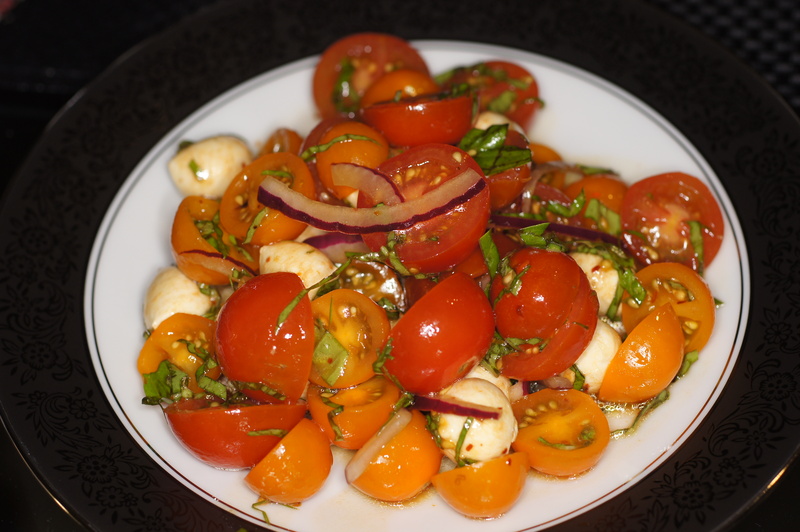 Originally, Caprese Salads were made with slices of tomato, slices of bufala mozzarella cheese with some whole fresh basil leaves, salt, and a drizzle of good olive oil. Because no one can leave a good thing alone, variations of the dish sprang up all over. 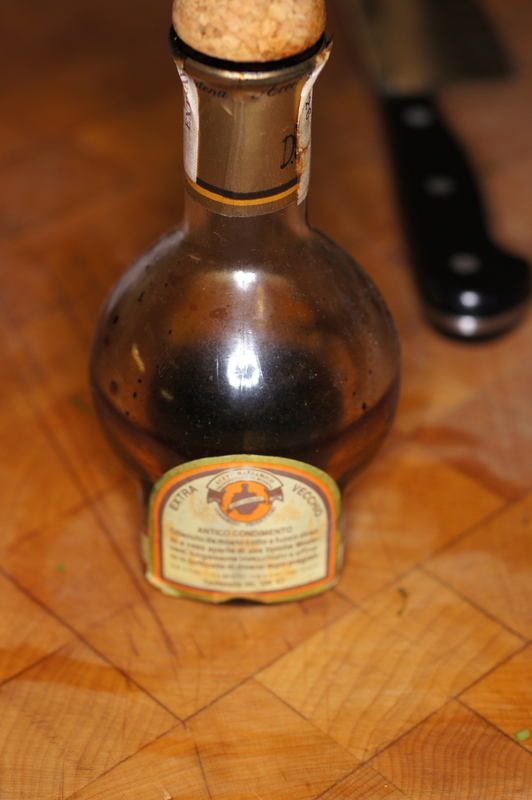 Balsamic vinegar started becoming a common variation, then capers, next a little crushed red pepper, etc. 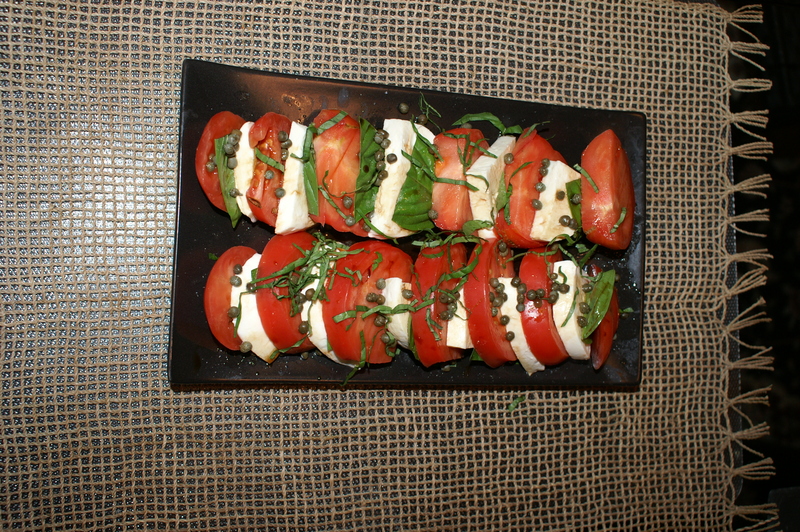 The following photo was our original spin on a traditional caprese. Delish! With all of the beautiful tomatoes in the market, we decided to try another spin on Caprese Salad to go with a pasta dinner. 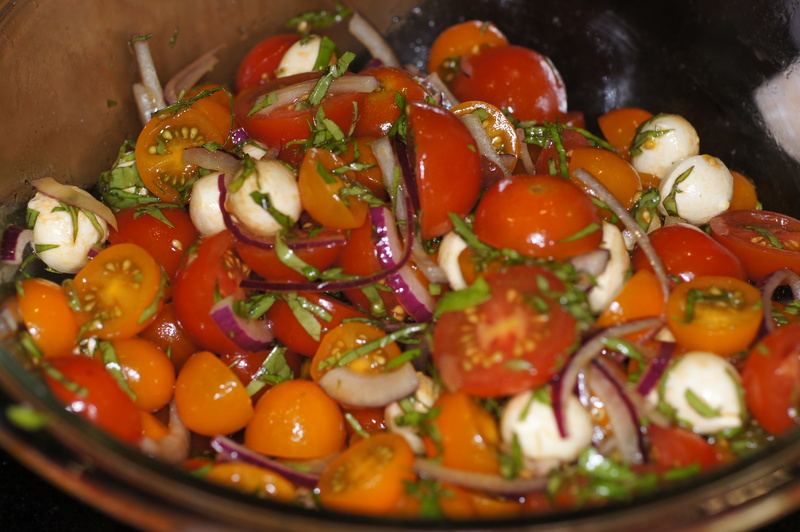 Instead of using tomato slices we would use halved cherry tomatoes. Also, we found some “Pearl Mozzarella” or Bambino Bocconcini. Bocconcini (mozzarella balls) is sold in a number of sizes including Bambini, Cherry, Traditional and Grande. Bambini Bocconcini (Baby Bocconcini) are the smallest size, with each ball weighing 5 grams each. These are delightful little morsels perfect for this salad. 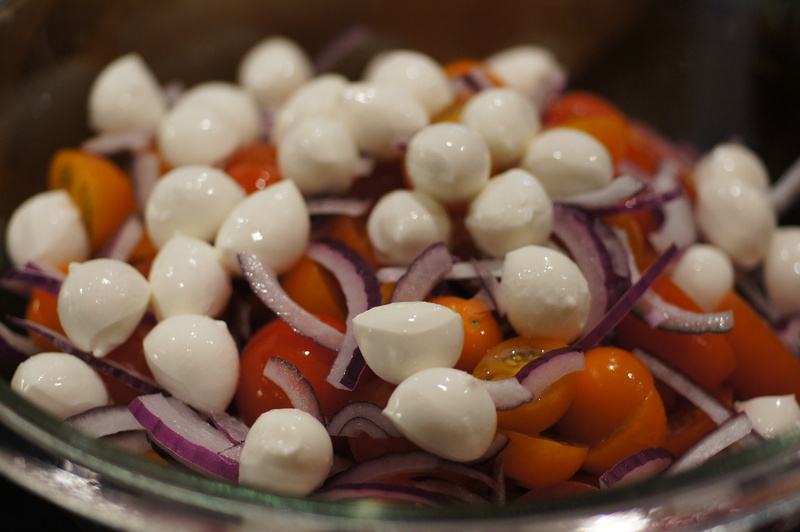 Combine tomatoes, mozzarella, and red onion slivers in a bowl and toss to mix. Now add the salt, crushed red pepper and basil. Toss gently to mix well. Finish with the good balsamic vinegar and good olive oil. Previous PostMango Gazpacho with Pickled ShrimpNext PostSous Vide – Coming soon! I agree with you completely! Thanks for dropping by and commenting. We really enjoyed this. You are seeing all of these little cherry, grape, sweet 100s, etc. in the market right now. We love the bright acidic sweetness of these little gems. They were perfect for this salad. Thanks for dropping by and commenting. This is a spectacular use for the little homegrown grape and cherry tomatoes that are just now coming ripe, at this time of the year. Thanks Doug. I hope you try it. It is delicious!